I try to shoot in a free style. The skills of using gears and retouching helps me to work in different genres of shooting, and I can do wedding, love-stories, farhion, art of a photo session, but most of all I prefer a creative photo or photo with some creative ideas. Thats why any of your non-standard proposals will always be encouraged me. Morning and evening photo sessions. The shooting lasts from 1 hour and until we will get a good result. I don’t limit the time. On average, 2-4 hours is enough. After 3 hours we always have enough material and if the shooting continues more, in any case we need a little rest. We start the morning shoot depending on sunrise (its depend on the time of year). For example, during the summer when dawn at 5 am we meet about half an hour before the shooting, in the winter it’s 7 o’clock in the morning. Balloons usually take off 15 minutes before dawn when the light is not yet convenient for our photo session. The first hour after sunrise is the best for a photo shoot. After balloons landing (if we are shooting with balloons) the light becomes more intense, accordingly the shadows become darker, which greatly complicates the shooting. It is possible to order photosession all day long. In this case, during the day I am traveling with you and taking pictures in different locations, according to your desires. But since it’s a daytime shooting, the art photography is impossible. You will get just a photo archive with color correction and retouching. From 2 days. In rare cases, till 1 month. Depends on the type of shooting and photographer workload. It is usually enough 1-2 days if the shooting doesn’t require special creative processing. If you need to make some creative photos, they take a very long time. Sometimes its 1-2 pictures per day. That’s why in such cases it is very difficult to say exactly when the result is ready. Time pressure always affects the outcome.P.S. I always try to give the photos as quickly as possible, firstly because I don’t like to be due. Secondly, because I have a lot of work and I want to give everything before I take the next photo shoot. Telegram. I can send you some thumbnails and HQ pictures on the same day via Telegram messenger. Also, it is possible to send via Telegram all processed photos by archive, since this messenger is really the most convenient for sending and storing large amounts of data. USB. I can give you all the photos in RAW format (* .cr2 in my case) if you have USB media (either in JPEG format), immediately after shooting.The size of the photos.If you want to take all RAW files at once, each RAW image takes about 50 MB. (Sometimes I shoot in the format Dual Pixel Raw for portraits where each photo is 90 MB). JPEG photos are about 7-10 MB per photo. On average during the morning shoot, we make 250-500 photos, it takes from 12 to 32 GB.Retouched photos take from 2 to 5 MB each and all archive from one shooting 150 – 350 MB. Shooting is possible in the hotel where you stay or all around the city within walking distance. Or other location shooting (observation points, valleys, launching sites of balloons) possible as well. Where is the best place to shoot? There are certain locations with beautiful views. It is possible to make a plan in advance to visit some of them. But if it is morning photo session with balloons then we can never know in which direction balloons will fly. Sometimes they just fly away from us into the distance and pictures from our sides can be not successful. In this case, there are two options: either to go to the place where you want and shoot as it is, or early in the morning as soon as they start taking off we can follow them according to wind direction and change locations spontaneously. Can I give the names of locations? Nope!!! There are just spots that I found and liked, they don’t have any name. I can send only GPS coordinates. But as the other photographers I also do my photo shoots in the most popular places. For example, Panoramic Sunset Point in Goreme, Love Valley, the Castle in the village of Uchhisar, the Valley of Monks and so on. Photo shooting in hotels. If you are staying in one hotel and want a photo shoot in some other, previously, you have to notify this fact. Most of the hotels don’t mind if you find an approach to them. Except of very few! Can I advise the hotel for our shooting? Yes. I have contacts of some hotel managers who can provide a nice place with decoration for photo sessions even if you stayed in other hotels. How we change locations for photo shootings? Some hotels provide transportation for an additional payment or sometimes free of charge. You can book a taxi or rent a car. The cost of a taxi starts from 5 euros around the city. But for 2-3 locations out of the city and for driver waiting you will get the same price as a renting car. The option to rent a car is the best choice according to the cost and practicality.The price for renting a car starts from 25 euros, and we have the opportunity to change as many locations with my recommendations. Are there any beautiful locations in the towns of Goreme, Avanos, Urgup, Uchhisar, Ortahisar, Cavusin? Yes, you can take good pictures everywhere. Goreme, Uchhisar and Cavusin are most certainly suitable for the morning shooting with balloons. Because they often fly above or near these villages. In any other there are a lot of beautiful places, hills, caves and so on. Photo shooting with a hot air balloons. If you are planing to fly a hot air balloon and to make a photo shoot with balloons you have to choose two different mornings. Why? Firstly, during the balloons launching it is still dark. Usually hey start before sunrise. You will be one hour in the sky and land after with the rest of the balloons in the same time. So its doesn’t have sense to continue photo shooting. I did such shootings many times, and the result was still satisfied. But it already depends on luck, because I’m chasing your balloon on the ground while you are in the sky, I’m climbing some high hills and take pictures from there. But no one never knows the exactly direction of wind, it may change during your one hour flight. Yes. Sometimes I accept professional models and bloggers for advertising. The conditions are always different, therefore the details are usually negotiated personally. When do balloons fly/don't fly? Balloons fly every day, if the weather conditions permit. This is not a one-time annual festival. When the weather is bad: snowing, raining, strong wind, your flight might be canceled. If the strength of wind reaches more than 10 km/h (you can check it by yourself in the forecast), then most likely they will not fly. Safety and reputation for companies are more expensive than any profit. Launching is usually early in the morning for several reasons. Firstly, balloons need a cold air to rise up. Secondly, the dawn in Cappadocia is really beautiful. Thirdly, before 8 am (as a rule) you manage to fly a hot air balloon, after which you can have breakfast at your hotel and at 9 am you are already free to any program for example for a tour around Cappadocia. In case of snow, rain or strong wind, flight can be transferred to the next day, if there are places. And so on until there weather will be fine for launching. Therefore, the following recommendation: book your flight for the first morning after arrival, to have more possibilities to fly. In autumn and spring, the weather is changeable. Sometimes those who came to Cappadocia for 2-3 days go back home without even seeing the balloons. But this is the weather! No one can ever give any guarantees! The maximum flight altitude is 600-800 m. above sea level. The height is regulated within Federal Aviation Regulations, depending on the weather conditions because in different layers of the atmosphere there may be different wind forces. Is it scary to fly on a hot air balloon? Fly is not so scary as it seems and even very safe. Every year about 500 thousand tourists fly in the sky. I will not dissemble that nothing never ever happened. Comparing with traffic accidents, which, according to the Pulitzer Center, take about 1 million 240 thousand lives a year, balloon flights are among the safest. People know about the possible risk on the road, but don’t refuse to drive a car and use public transport! Similarly, a tourist who has a dream to reach the sky by the first air transport in history, will not deny himself this pleasure. Besides when you see fascinating landscapes you will forget about your fear of flying! Children under 6 years are not allowed to fly (cause of safety reason). Children from 6 to 12 years, inclusive, 50% discount. Flights are divided into 60 min and 90 min. Baskets size are different, depending on the rules of the company, not counting private flights, it ranges from 10 to 21 passengers. Dress code: you need to dress warmer than during the daytime. Firstly, flights are conducted early in the morning at dawn. Secondly, in the atmosphere, the higher the colder. How to choose balloons company? In Cappadocia, there are about 25 balloons companies. All companies are private, so there is a big competition between them. But all of them approximately have the same quality of service and balloons. All pilots have licenses, all flights are insured, all baskets have a high quality and so on. 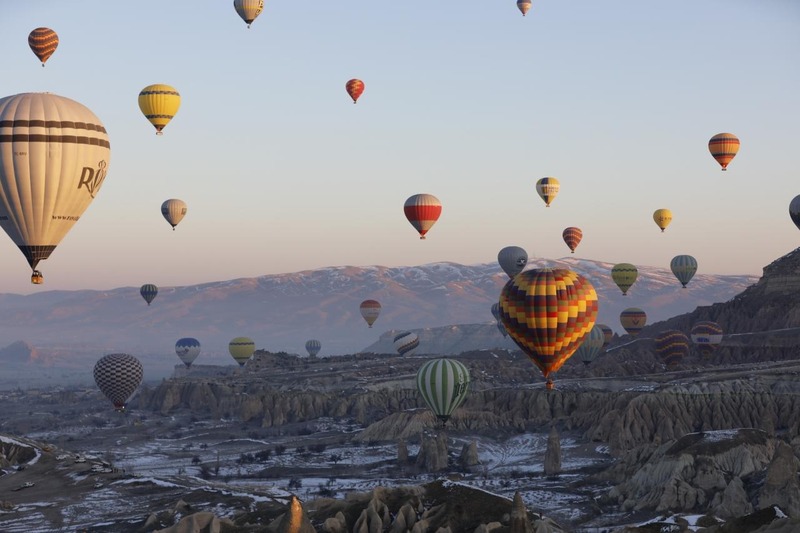 The fixed price of a hot air balloon flight in Cappadocia doesn’t exist. Different companies offer different prices. Prices in all companies double increased since February 2018. Last year the average cost was 100-120 euros for the flight. For today, it approached to 150-175 euros per flight. Some agencies and hotels offer cheaper prices. There is no trick in this. They can have certain agreements with companies or the owner of the hotel/touristic agency is the owner of balloon company in the same time. Also, there are different bonuses and discounts. In case you want to order hot air balloon tour – I can help you to make reservation. 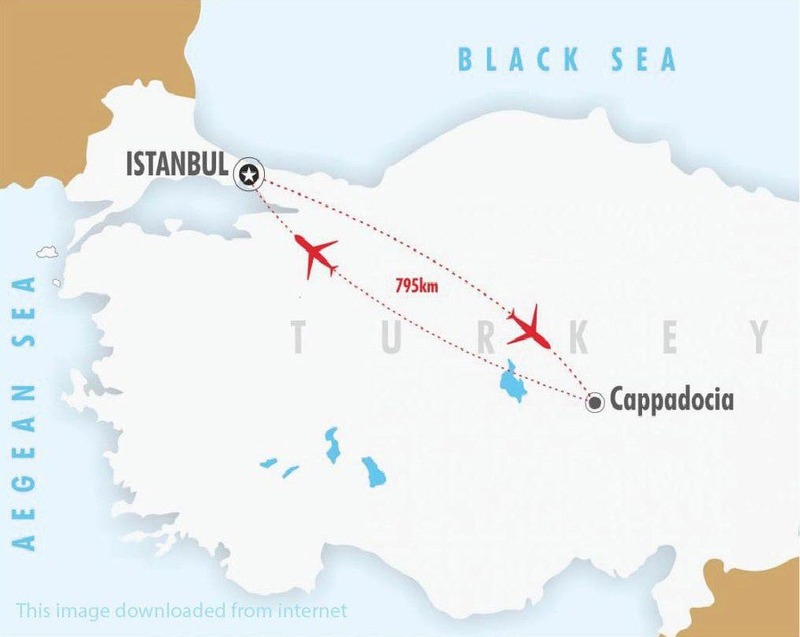 – Cappadocia is a large area with two airports: Kayseri (ASR) and Nevsehir (NAV). Airlines: Pegasus, Onur Air, Atlas jet, Turkish airlines. Need to know: there are 2 airports in Istanbul – Ataturk and Sabiha Gökçen!!! Be careful when you are buying tickets. Flights to Istanbul and from Istanbul must be from the same airport. Airlines: Pegasus, Turkish airlines, Anadolujet. Need to know: You can take a shuttle from both airports directly to your hotel. We will gladly help you to organize it! If you have already arrived to Turkey to any other city, you can reach Cappadocia by buse companies such as: Metro, Kamil Koç, Nevşehir, Süha, etc. They are with high comfort level: air conditioners, snacks, drinks, TVs (tablets), Wi-Fi (dubious)! Unfortunately the transport system between small towns is not well established. Especially if we are talking about tourists. Because without language knowledge it is difficult to figure out when and where a bus goes! Option number 1, for tourists who don’t have time and desire to care about moving, searching for a bus station and routes. This is a tour. We advise you to book a bus tour around Cappadocia. Thus you can visit all the sights and listen to a guide who will tell all the secrets of these places. We also recommend this option to older people, families with children, and disabled people. It’s not difficult to order a tour, you just need to write to us and we will help you to organize a group or individual program for your taste! The second option is renting a car or scooter or even a bicycle (you will not go far with it). 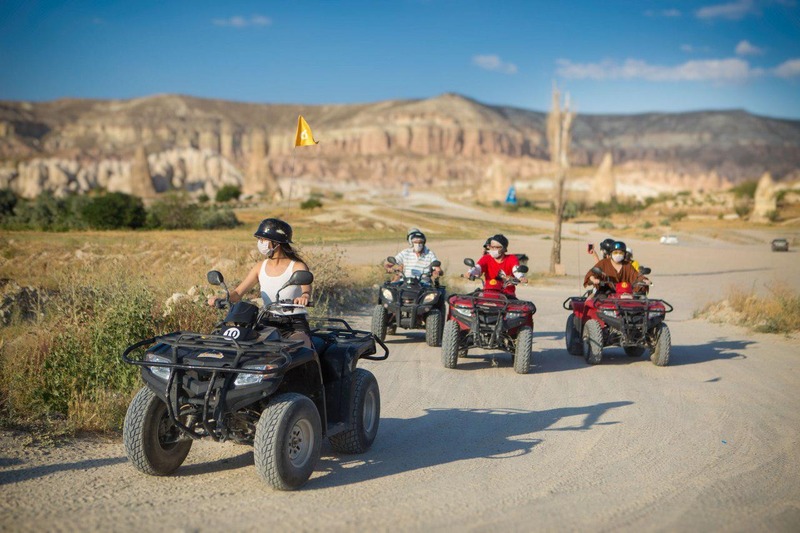 You can rent transport in any village of Cappadocia! This option is suitable for those who wants to be independent from group, manage their time and explore everything by themselves. Also it can approach to all of the categories of people above. The third option is less expensive than the previous two, but time-consuming. We offer to use the public transport. For example, from Nevsehir (the biggest traffic junction in the district) you can reach any village by bus and it will cost you from 2 to 5 lire for one direction (1 euro = 4.6 lire on 19.02.18). Remember you may take a bus until 7-8 pm! The buses run every half an hour or once per hour (depending on the town, destination and time of the day). Another down side that not everywhere you can go by bus. There is no local transport to such tourist destinations as Pashaba (Paşabağı) – “monk valley”, Devrent valley (Devrent vadisi). Also there are no direct buses to Ihlara canyon and underground cities. The fourth option is free and suitable for backpackers and tourists who love to communicate with the local people. This is a hitchhiking! The distances between villages are very short, from 5 to 15 km from each other, so even the locals use the hitchhiking. It is enough to show town on the map or to say the name of place and any local driver with pleasure will give you a lift! Thus, you will have not only transport, but also an opportunity to get to know the bearers of this beautiful culture. The best season to visit Cappadocia? Cappadocia is the central region of Turkey with a sharply continental climate, so the summer is hot and the winter is cold. But this is not a hindrance for the tourist season! Let’s start with a beautiful time when everything is green and blooming. Spring ….. The beginning of spring is the time of rain (maybe even hail). But the end of April and May please tourists with stable warm weather. During the summer temperature can reach +35 ° C, no rain, everything green turns to yellow very quickly, even before the autumn season. People who don’t like heat will immediately give up. But not everything is as bad as it seems. Firstly, to stay in the cave room of the hotel during the summer is a blessing. Cause there is cool without an air conditioner, thanks to the properties of tuff. Secondly, for lovers of water, there is a large selection of hotels with swimming pools, both indoor and outdoor.Did you already imagine yourself swimming in the pool at dawn and watching a hundred balloons in the sky ???? By the way, in summer the probability of bad weather is very small, therefore the cancellation of flights is a rare occurrence. In the third, sightseeing buses with air conditioners will save you from hot hiking. And in the end, the traditional Marash ice cream will taste very well in hot weather! Autumn ….. autumn here is warm, September can be even hot, rains are not often. But in the evenings you begin to feel the autumn coolness. 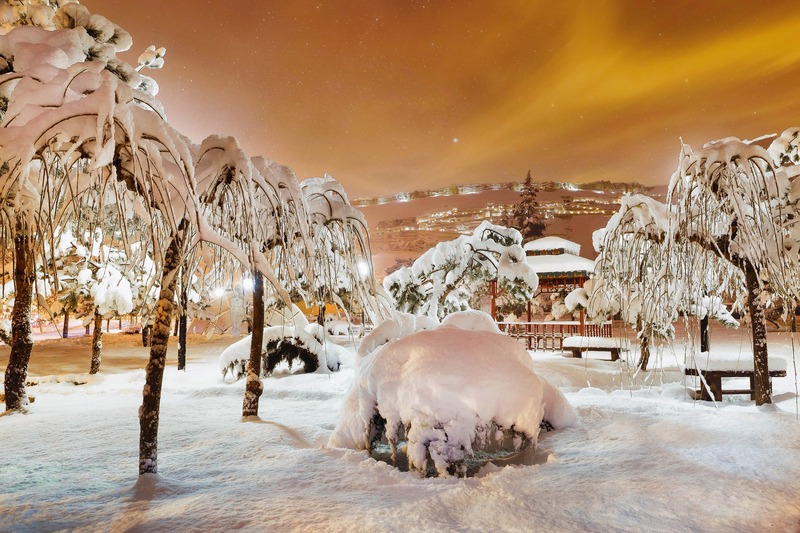 The temperature at night, in comparison with the day, can fall down to 10 degrees. A wonderful time for hiking: exploration of caves, Christian rock churches, monasteries and walks in incredible valleys with lunar landscapes. The winter season is also a tourist season. Winter is lengthy, as Cappadocia lies at an altitude of 1000 m above sea level. The temperature can drop to -20 ° C. Because of the snowy and windy weather, balloon flight can be canceled very often. But there is a bonus of cold weather – hot air balloons can rise to the sky not only early in the morning, but also throughout the day! In winter, there are a lot of things to do: you can ride on snow-covered hills on quadracycles, go to a real Turkish hammam, go to a ski resort on Erciyes mountain and much more (see the next article). At any time of year, Cappadocia is beautiful, unique, fascinating with natural creations. Therefore, we conclude that the best season for visiting Cappadocia is a matter of taste, your interests and desires! We are waiting for you 365 days a year! Tourism in Cappadocia came relatively recently. Since UNESCO took control of this region in 1985, everything began to be restored, built and attract people who want to see new places. Cappadocia became famous either for its lunar landscapes, whether its deep history, or for balloon flights or for everything in complex. To my opinion, the main entertainment is balloon flights. In the early morning, about a hundred colorful balls hover in the sky. What can be better than to meet the first rays of the sun at a bird’s eye height, looking at the fantastic valleys? Some tourists come just for this, even without realizing that perhaps in this region was born one of the first civilizations. In the second place I will highlight the history of this place. Many artifacts of different civilizations were found in Cappadocia, ranging from Hatti and Hittites. One of the most famous fact is that this land gave the world about 115 holy martyrs, who are revered both in Christianity and in Catholicism. Therefore, entertainment number two is a historical and pilgrimage tours with guides. You can not only look deep into the history, but even touch it. Also, among the entertainment there are horse riding tours in the valleys, ATV tours, walking tours. You can visit “Turkish Night show”, “Whirling Dervishes” show, feel like a real master at a pottery master class, go to a real Turkish Hamam and visit the “Erciyes” ski resort in the winter season. I’ll write gastronomic tourism also as a type of entertainments, because the Turkish national cuisine is very rich for traditional dishes and Turkish delights. You can taste the delicious Cappadocian wine right at the factory and buy several bottles for relatives. In the end, you can buy colorful Turkish souvenirs (Cappadocia is especially rich for jewelries) and order a fabulous photo session for memory. I think you already understood you will not get bored here! If you are interested in something, we will be happy to help to realize your wishes! See you in Cappadocia!